How Does UV Work: Ultraviolet (UV) disinfection inactivates microscopic organisms such as bacteria, viruses, protozoa and other pathogens in wastewater by exposing them to light of a specific wave length. More specifically, a wavelength between 250 and 270 nm is optimal for disinfection, which is shorter than that of visible light. The dose required to inactivate an organism is a function of light intensity, dose time, reactor configuration (hydraulics, etc.) and the quality of the wastewater effluent. It is extremely important to evaluate the quality of the wastewater to be disinfected during the design phase to ensure UV is the most appropriate disinfection technology. Why Consider UV: UV is an excellent alternative to using chlorine for disinfection. In recent years, State and Federal regulations have lowered the wastewater discharge permit limit for e-coli, which in turn requires operators to increase chlorine dosage. At the same time, the regulations have reduced the allowable instream concentration for residual chlorine. In addition, there is concern with discharging potentially hazardous chlorinated organic compounds. Handling chlorine is also an operator safety concern. UV is an effective disinfectant and it leaves no residual concentration of harmful pollutants in the stream. It is also relatively safe to operate, but operators do need to be aware of the possible harmful impacts of UV exposure. What Is a UV System: In general, a UV system consists of mercury arc lamps or amalgam lamps, a reactor (concrete channel or stainless steel vessel), ballasts and a control system. The lamps are either low-pressure or medium-pressure devices with low or high intensities. Which lamp is most appropriate varies with the application of the technology, the size of the plant and wastewater quality. The UV lamps are not directly exposed to the wastewater, but are protected by a clear quartz sleeve. These sleeves can experience iron coating and develop mineral scales that reduce light transmittance and must be periodically cleaned. Lamp cleaning is an important design and operation and maintenance consideration. An effective cleaning program is essential to the long term performance of a UV disinfection system and the avoidance of permit violations. 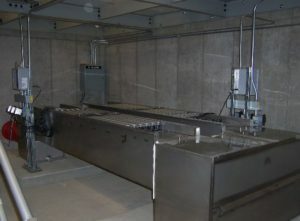 Open Channel UV Configuration: In the open channel configuration, UV lamps are placed in concrete channels or pre-fabricated stainless steel channels. 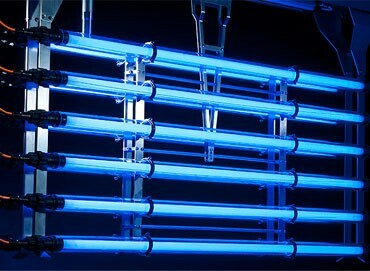 Open channel UV disinfection is typically used when the wastewater is discharged by gravity flow. The lamps are accessible and easily removed for replacement and cleaning. The lamps are typically mounted on racks of several individual lamps. These racks are then combined into a larger superstructure referred to as a bank. Several banks may be installed in the channels to make up the entire UV system. 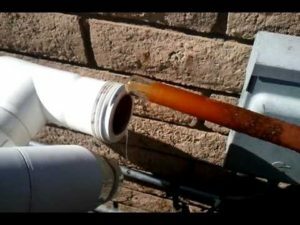 Closed-vessel UV Configuration: It is not always possible to discharge wastewater to the receiving stream by gravity and pumping is required. In these cases, closed-vessel systems may be a good choice. Closed-vessel systems house the UV lamps in a closed pressure vessel that may be connected to an effluent pump and piping system. The performance of closed-vessel systems have greatly improved with the advent of improved quartz sleeve cleaning systems. Closed-vessel UV systems are more susceptible to damage by debris and plugging. UV Features and Controls: Both open channel and closed vessel systems include lamp intensity monitoring systems to inform operators when lamps need to be replaced. In addition, Flow paced systems are available to adjust dosage based on flow. Controls may also adjust intensity based on changes in the Ultraviolet transmission (UVT) of the wastewater effluent. Many of the UV Systems come with automated self-cleaning systems, but operators will still need to periodically remove and and clean lamps manually. Systems that combine mechanical and chemical cleaning are much more effective than mechanical cleaning alone. 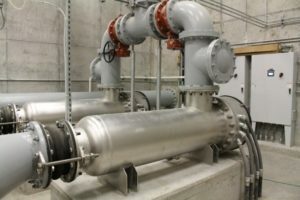 Wastewater Effluent Quality and Design Considerations: Total Suspended Solids (TSS) can shield organisms from the light and absorb UV radiation, making the system less effective. It is important that the wastewater being disinfected have a low TSS (typically < 30 mg/l). 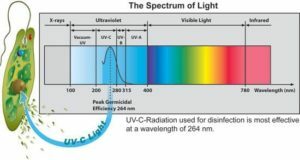 UVT is an extremely important factor in the design of UV systems and should be greater than 65%. UVT must be analyzed in detail as part of the design process. In general, unfiltered secondary effluent has a UVT of 65% or greater. Higher UVT is possible with filtered effluent. Dissolved and suspended iron will also shield organisms and absorb UV radiation as well as coat the quartz sleeve, greatly reducing disinfection efficiency. In addition, dissolved salts can precipitate on the quartz sleeves and reduce light exposure to the wastewater effluent. The design process should adjust the UV dosage to account for these and other factors that degrade the performance of the UV system over time. This includes the following factors: the new quartz sleeve transmittance factor, the quartz sleeve fouling factor, lamp energy conversion efficiency and end of lamp life factor. Validating the reactor dose delivered using third party field validation (Bioassay) is essential. In summary, applying UV disinfection to the right application and properly designing the system will result in a reliable and relatively simple solution to wastewater disinfection needs for communities of all sizes.